Moroccan week is over and, overall, it was very successful! 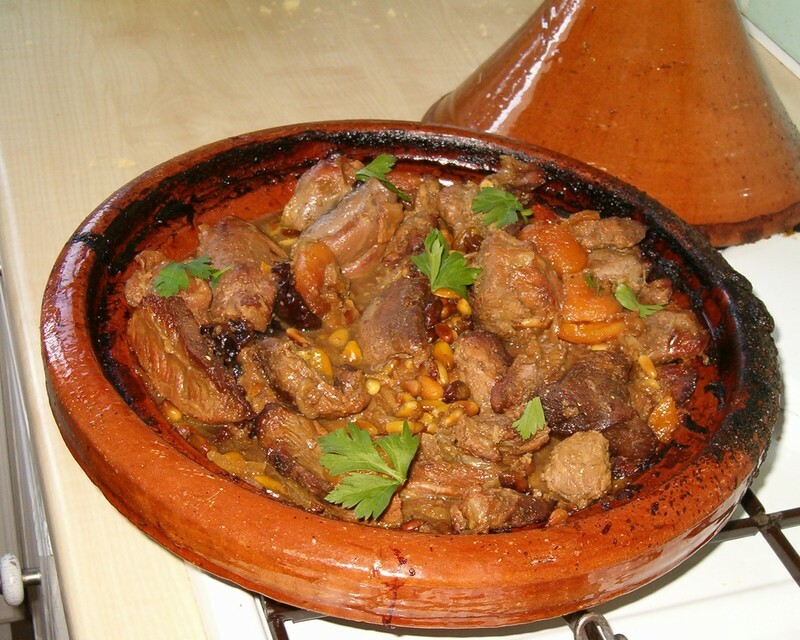 Most of the dishes I chose to cook were stews, not sure if that’s because those are the dishes I just happened to pick out, or because that is what the majority of Moroccan entries are. The only non-soup/stew that I made was the wonderfully (and sinfully) delicious Chicken B’stila – keep reading for the details! Moroccan flavors: saffron, sweet Hungarian paprika, cilantro, parsley, turmeric, ginger. This was a rather delicious stew. Aside from the perfectly tender bites of lamb, I’d say the highlight was the sun-dried tomatoes – they really made the dish pop. This stew was spiced with saffron, turmeric, cilantro and parsley. My first go at cooking mahimahi seemed to go rather well. I don’t think I overcooked it (too much)! This stew was spiced with cilantro, sweet Hungarian paprika, saffron, ginger, cumin, and garlic – which gave it a full, rich flavor. But what really gave it a kick was the green olives! One ingredient I left out was a tablespoon of preserved lemon pulp (which I didn’t have 6 weeks to wait on), I’m not sure how much of a difference it would have made, but I tried to substitue with a bit of grated lemon rind. 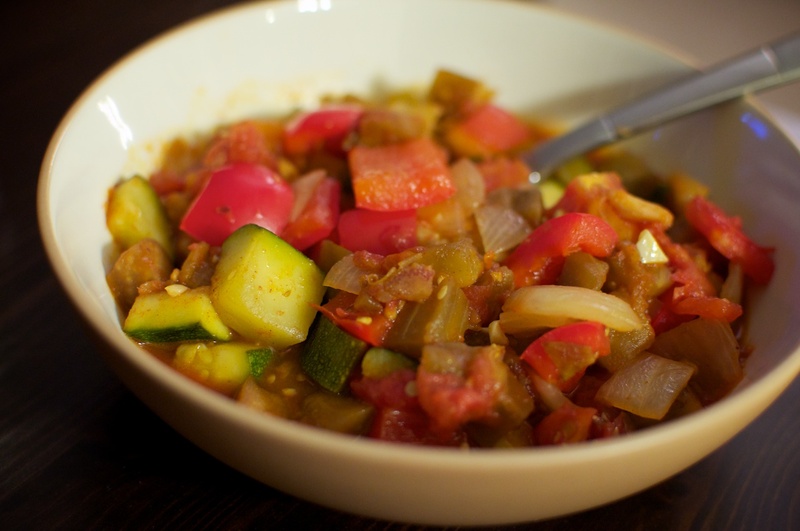 This seemed like a pretty typical ratatouille, spiced primarily with rosemary, a bay leaf, and sweet Hungarian paprika. 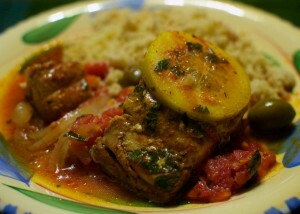 It contained onion, red bell peppers, tomatoes, eggplant, zucchini, and the best part – dates. The dates really helped round out the flavors and give it a smooth sweetness. Holy mother of god. This was like eating baklava stuffed with spiced chicken, onion, and eggs. It was like dessert for dinner. The whole pie contained about a cup of powdered sugar! 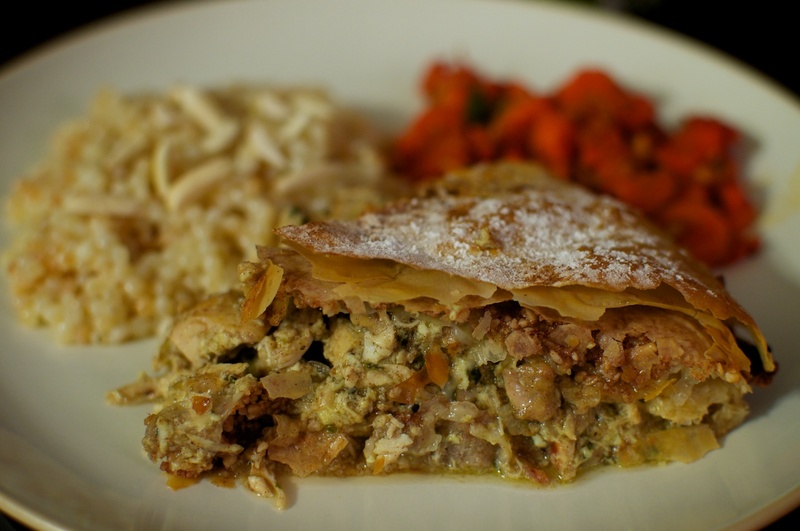 Between the cinnamon’y-sugary, savory slow cooked chicken filling and the flaky phyllo wrapper – it really just melted in your mouth. The pie all by it self was a 5/5 – but! 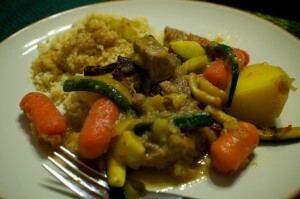 accompanied by Israeli couscous and caramelized carrots – Adam gave the whole meal a record-breaking 6/5!! 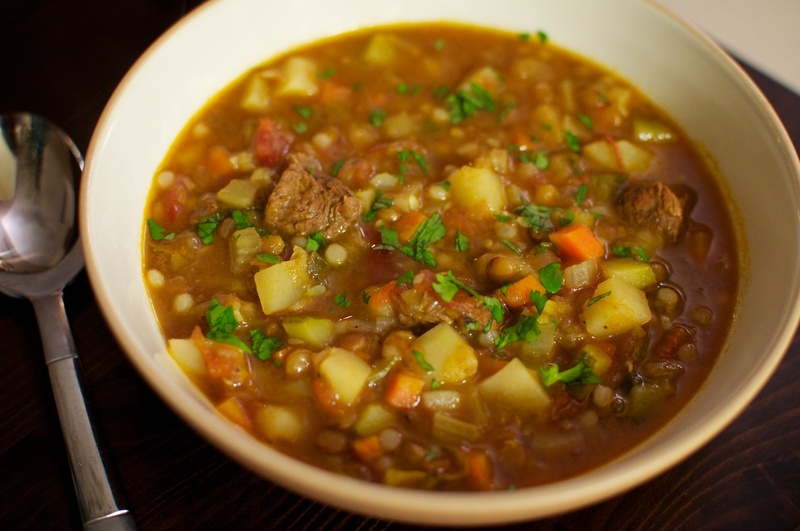 A hearty beef soup with strong saffron flavor. There were a ton of great vegetables in this one – onion, tomato, carrots, potatoes, zucchini, celery. Thickened up with lentils and Israeli couscous. A rather good ending to the week! That’s it for Moroccan week! Only three more cuisine weeks left this year – next up is Thai! I do love me some good Thai food, so it should be a fun week! Posted September 30, 2012 at 11:32 pm in Cooking and tagged 2012, Cooking, food. Comments RSS. Post a comment. Did you visit Morocco before ? I have not been to Morocco yet, but it’s definitely on the short list! I hope you come to visit Morocco :) You are welcome in our country !